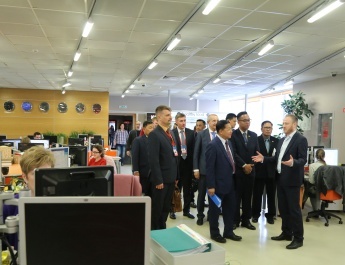 Promotion of sport sector means improving national defence power in terms of morality. When our country wins medals, raises the State flag and plays national anthem by all participants, it makes us have the spirit of cherishing our country more. 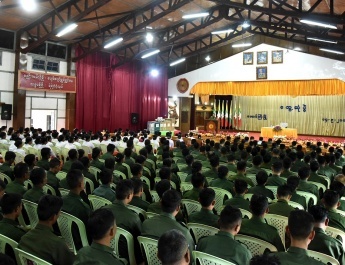 This is why all our sports contestants need to try to win more victories so they can be imbued with cherishing the country more, said Commander-in-Chief of Defence Services Senior General Min Aung Hlaing at a ceremony to honour the victorious Tatmadaw sportspersons and coaches who won medals at the 27th ASEAN Armies Rifle Meet, held at Bayintnaung Villa here this afternoon. 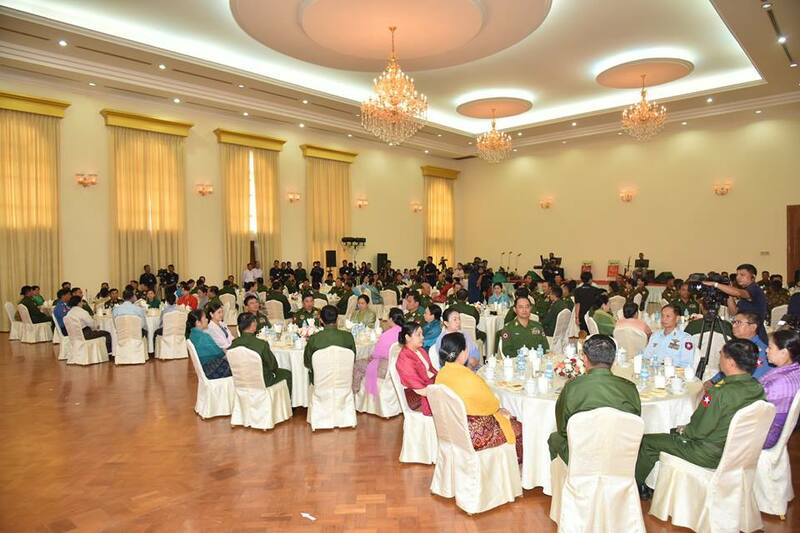 Also present at the ceremony were the Senior General’s wife Daw Kyu Kyu Hla, Deputy Commander-in-Chief of Defence Services Commander-in-Chief (Army) Vice-Senior General Soe Win and wife Daw Than Than Nwe, Union Minister for Defence Lt-Gen Sein Win, Union Minister for Border Affairs Lt-Gen Ye Aung and wife, Chief of the General Staff (Army, Navy and Air) General Mya Tun Oo and wife, Commander-in-Chief (Navy) Admiral Tin Aung San and wife, Commander-in-Chief (Air) General Maung Maung Kyaw and wife, senior military officers of the Office of the Commander-in-Chief (Army), the commander of Nay Pyi Taw Command, victorious athletes and coaches. 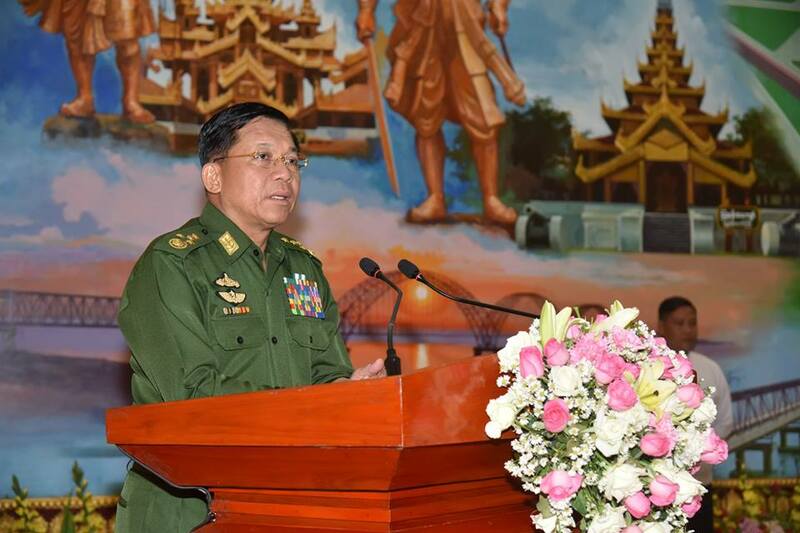 Giving an honorary speech, the Senior General said the Myanmar Tatmadaw started competing in ASEAN Armies Rifle Meet in 2000 and women’s pistol team secured three gold medals. In the Tatmadaw, five major sports are being played and they are football, volleyball, shooting, boxing and track and field. As football and volleyball are played in teams, they are regarded as major sports of the Tatmadaw. Since the Tatmadaw is mainly responsible for national defence, every Tatmadawman must be skilled in shooting. Boxing helps a Tatmadawman have the courage in fighting a battle, while the sport of track and field can help him increase stamina, the Senior General commented. 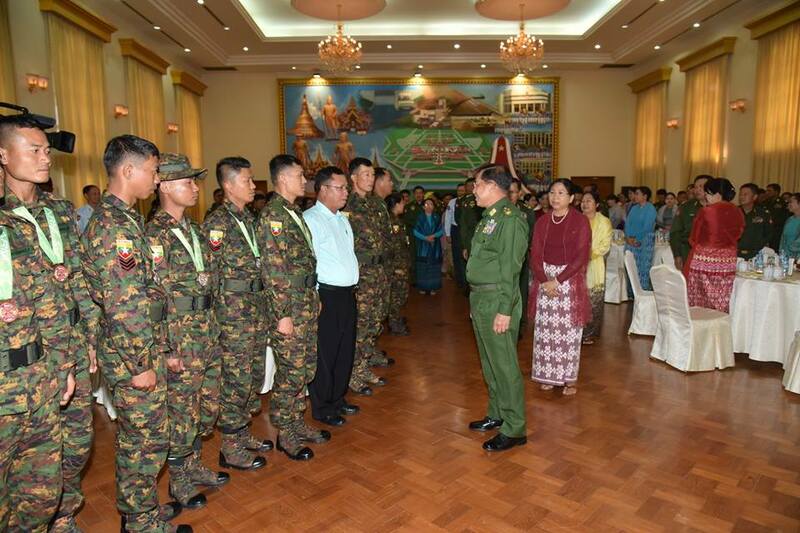 The Senior General further explained the Commander-in-Chief of Defence Services’ Trophy Tatmadaw (Army, Navy and Air) Shooting Championship is held yearly. Myanmar shooters bagged prizes in some events of the ASEAN Armies Rifle Meets with the use of guns manufactured by the Myanmar Armed Forces in showing excellent performance, contributing towards the capability of the Tatmadaw on one hand. As the women’s shooting team performed securing the gold medal, the victory becomes a mental power for some women who are wives of Tatmadawmen because they themselves participate in taking security measures of their military units. Myanmar shooting team has set the best records to bring honour to the State by winning prizes not only at the ASEAN level but also at the world level shooting championships. So, the athletes need to try hard to show their excellent performances. 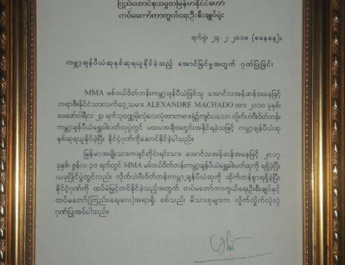 At present, Myanmar is on the path of multi-party democracy. To be able to do so, Tatmadawmen must make vigorous efforts for carrying out peace and stability of the nation and development tasks. At this juncture, only when Tatmadawmen have high capability, will they achieve victory through their efforts. 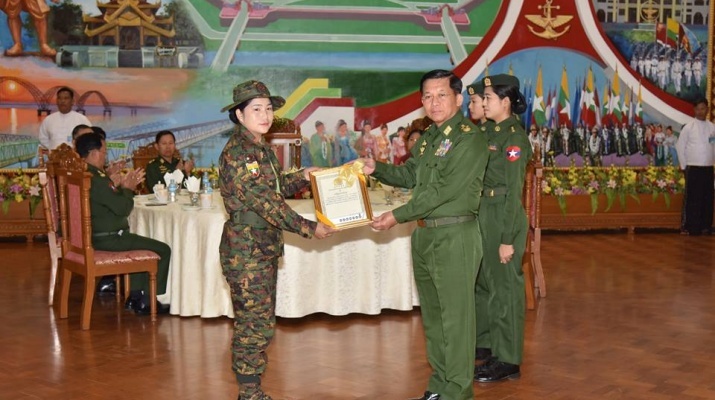 Afterwards, the Senior General presented certificates of honour and cash awards to Warrant Officer Nan Yu Wah Hlaing, Warrant Officer Cho Mar Hlaing and Sergeant/Clerk Ei Myat Phyu from the team which won one gold medal in the women’s pistol team-wise event in the 27th ASEAN Armies Rifle Meet while his wife Daw Kyu Kyu Hla gave certificates of honour and cash awards to Production Technicians Ma Aye Aye Myint and Ma Aye Aye Nyein. Vice-Senior General Soe Win presented certificates of honour and cash awards to Captain Ye Tun Ko, Captain Min Bo and Sergeant Zaw Ja from the team which won one silver medal in the men’s pistol team-wise event and his wife to Corporal Ye Tun and Lance Corporal Zin Min Aung. 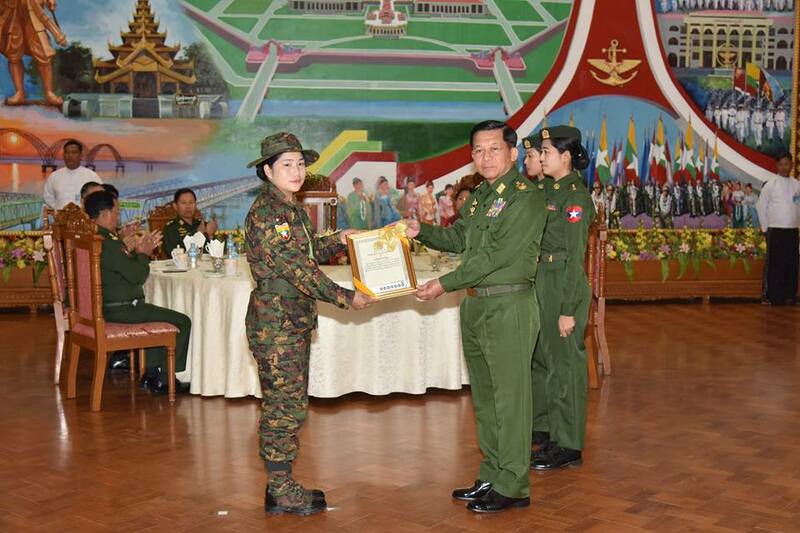 General Mya Tun Oo presented certificates of honour and cash awards to Lieutenant Soe Lin Htaik, Corporal Nay Thu and Corporal Aung Aung from the team which bagged one bronze medal in the team-wise machine gun event, Admiral Tin Aung San to Lance Corporal Yazar Kyaw, Private Aung Myint Than and Private Nyan Myint Oo from the team which won one bronze medal in the team-wise machine gun event and General Maung Maung Kyaw to Coaches Captain Daw Khin Nanda Tun and Staff Sergeant Ngai Kee of the women’s pistol team for their excellent performance to secure the gold medal in the event. Warrant Officer Cho Mar Hlaing from the women’s gold medallist team spoke words of thanks. Next, those present joined the honorary tea party. During the tea party, the Myawady entertainment troupe under the Directorate of Public Relations and Psychological Warfare presented songs. 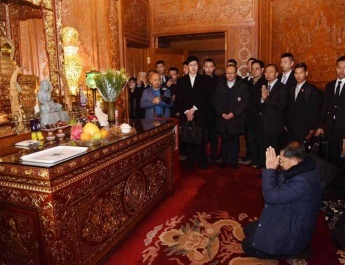 After the ceremony, the Senior General, wife and party cordially greeted those present.